How to portray executioners? Why are so few documentaries dealing with the representation of those who seem to place so little value on humanity: warlords, hangmen, killers, personifications of “absolute evil”? Is the documentary form, as Jean-Luc Godard once suggested, then the de facto domain of their counter-image: the victims? These are some of the questions that filmmaker Eyal Sivan (Israel, 1964) wrestles with, most explicitly in Un spécialiste, portrait d'un criminel moderne (1999), his examination of the infamous trial of Adolf Eichmann. 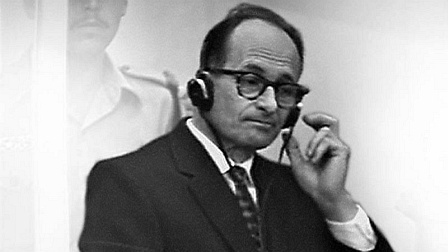 The film, inspired by Hannah Arendt’s controversial book Eichmann in Jerusalem, report on the banality of evil and written in cooperation with Rony Brauman, is drawn from 350 hours of recordings bearing witness to the trial of one of the architects of the Holocaust, a man who has been depicted as a blood thirsty maniac but who came across as a bland bureaucrat, disconcerting in his banality. In the words of Arendt: “this normality was more frightening than all the atrocities together”. However, Sivan and Brauman are not as interested in the psychology of the accused as they are in the mechanism of justification of his crimes. “We have done nothing more than expose, in the form of a indictment, of Eichmann’s defensive position”, is what they wrote in Éloge de la désobéissance, the booklet that accompanies the film. Thus the film offers a cutting insight into a system that is effectively predicated on denial and disculpation – “when everyone is guilty, nobody is guilty” (Arendt). But the film also insinuates that the regime of justification does not only apply to the history of the genocide of the Jews in Europe but also to the history of the state of Israel. Are the Palestinians, as Edward Said asserted, not “the victims of the victims”?